Cape Town – It’s instinct to swim away from things that scare us, especially a 23m long prehistoric shark. But Jason Statham swims towards it. The action star takes the lead in what some have described as a modern-day Jaws and for someone who has admitted he doesn’t scare easily, taking on the monstrous sea animal was a breeze. “The first thing I consider when reading a script is whether I can do justice to the role. The Meg played to my fascination with the underwater world and to my love of scuba diving. So, it was very appealing to me – and a nice change of pace,” Statham says of what drew him to do the film. Before his action acting career took off Statham spent his days diving and even competed in the Commonwealth Games in Auckland in 1990 for England. And while his diving days are over, Statham still regularly enjoys scuba diving. While Statham was somewhat prepared for his role, the amount of underwater work requires a fine-tuned skill. Statham further reveals he first learned to scuba dive when filming The Transporter back in 2002 and it was no easy task. In the film viewers will quickly learn Statham’s character is a total badass but is put into seriously sticky situations, even if it’s with a CGI shark. Speaking about filming one scene in particular, in which Statham has to tag the megaladon, the English actor says his initial thought was how it was going to be filmed. He adds that the pressure of making it a perfect scene saw him spending the entire day in the ocean. 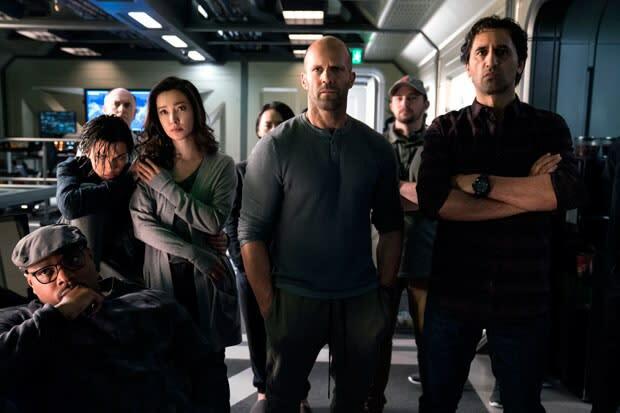 The Meg boasts a massive international cast and crew from all-over the world including China, the US, the UK, Iceland, New Zealand, Japan and Australia – something Statham really enjoys and is familiar with. To keep such a large cast happy a positive vibe is needed on set, which Statham says, was well achieved by director Jon Turteltaub. READ NEXT: What's in the box? Tell us and you could win! The Meg is currently show in SA cinemas.